it’s been a big month in development announcements around the city. bridgestone americas plan to move their corporate offices to a yet-to-be-built 30-story high rise in sobro was probably one of the biggest victories. sandwiched between the river and the country music hall of fame on demonbreun street, the bridgestone tower will be one of the tallest towers in the city. the upcoming jw marriott & office building on 8th. or a very large deodorant stick…hard to tell. bridgestone will bring 1,700 employees, including 600 currently out-of-state ones, to the downtown. they will be the lone tenant in the building. 4 blocks up on 8th & demonbreun, a 35-story jw marriott hotel and a 25-story office building are in the works on a 3.7 acre lot. 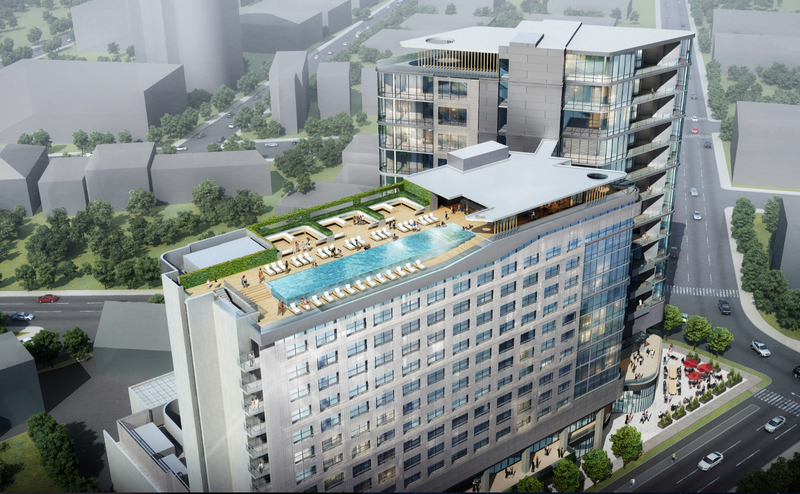 the project includes 500-600 room hotel rooms and about 400,000 square feet of office space. the hotel will create 650 jobs for downtown and the office space could house upwards of 1,200. they hope to break ground next summer with a late 2017 opening. 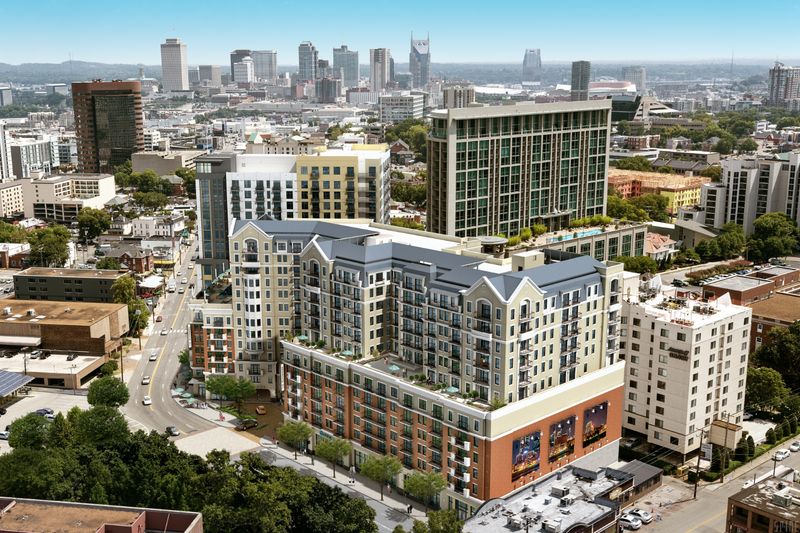 next door on the 8th avenue roundabout at 100 clark place, developers plan to break ground any day on nashville’s first westin hotel as well. the 27-story, 452-room tower is also scheduled to be completed by 2017.
a little closer to the river at 418 second street, tony giarratana’s 33-story luxury apartment project is currently being erected. 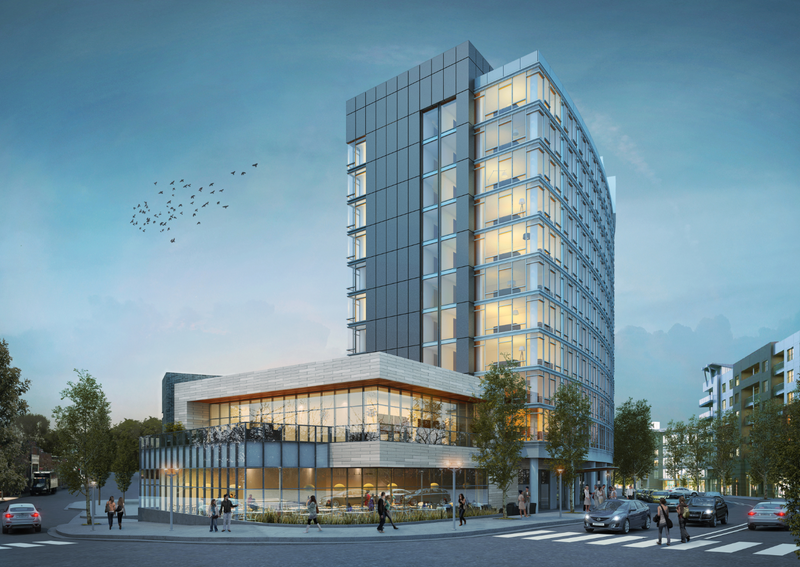 the aptly named sobro will include 342 apartments, 378 parking spaces and 18,000 square feet of street level retail. lastly, a $75 million 23-story apartment high rise is being proposed at 641 division street, right behind pour house burgers and frugal mcdougal on 8th avenue south. currently, the 1.2 acre lot is home to myers flooring. 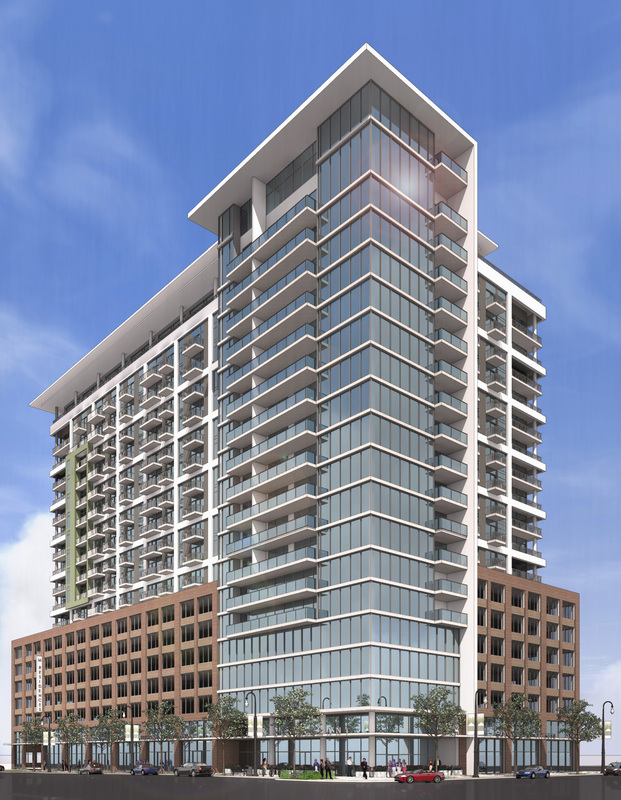 the crescendo will be 330 apartments, ground level retail, and a garage that will house 600 parking spaces. 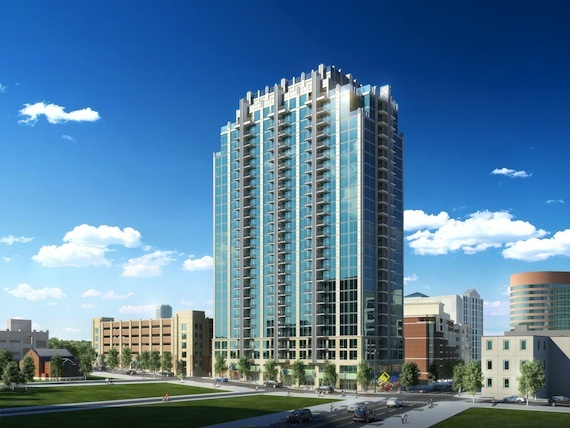 construction will begin in late spring 2015.
it’s worth noting for comparison purposes, the very visible twelve twelve high rise which is wrapping up construction this week in the gulch is 23 stories. the at&t building downtown, most commonly known as the “batman building,” is 33 stories. 2-nashville bcycle program-with over 190 bikes at 20 automated kiosks all over the city, the nashville bcycle program is a great way to see the city. pick one up from one station, drop it off at another. two new locations this spring: 12south at 12 south flats and 12south at sevier park. for more locations & costs, click here. 3-experience the greenways-with close to 200 miles of paved or primitive trails in the nashville area, you could hike or run for awhile before you had to repeat the same course even. for maps, click here. the class was a vigorous combination of both traditional and modified versions of ancient postures but also incorporated a good balance of meditation. although hot power yoga is designed to energize you and center you, i longed to collapse somewhere in a cold, dark place afterwards. initially, i was going to do 6 consecutive workouts in 6 days and blog about it. after doing barry’s full body workout right out of the box and being rendered useless for a day or so afterwards, i decided to pace myself. the session lasted an hour and was a full body with 50% cardio/running, 50% weights. this “ultimate” session had running at the end but the cardio was mostly driven around rowing which tones up the legs, shoulder & back. we alternated between rowing & weights and finished with the treadmill. everyone seemed really in shape in my class especially the reigning miss tennessee who rowed next to me…i was thankful to be in low light. one hour that seemed to solve any anger management problems i had. the punching worked the arms and abs evenly i felt like and the kicking seemed to work the quads and gluts a lot for me personally. so much sweat. had to be a good thing right? i did a class called “raw yoked” which has no treadmill but is essentially “cardio-lifting.” pretty well-rounded class, working everything. and it was half an hour. i thought to myself ‘i got this’. 20 minutes in, i was crashing. burpees, mountain climbing, crunches, dead weights, bicep curls, etc and they were all timed. i’m realizing i don’t love working out. i’m also realizing i need classes like this to push me to do it. left to my own devices in the gym and i will just get stuck in a rut doing things i like to do. no machines. rebecca says barbell exercises are the most efficient way to train. although there is some pre crossfit barbell exercises, the core part of crossfit really only lasts 6 minutes. i took my class with some high school football players and as she wrote how many reps we did on the dry erase board, i felt my competitive spirit come out. the outcome: initially i won although they were probably fine the rest of the week as i laid on a heating pad. know your body. are any of these working for you? what are you doing to stay in shape, nashville? any good tips?